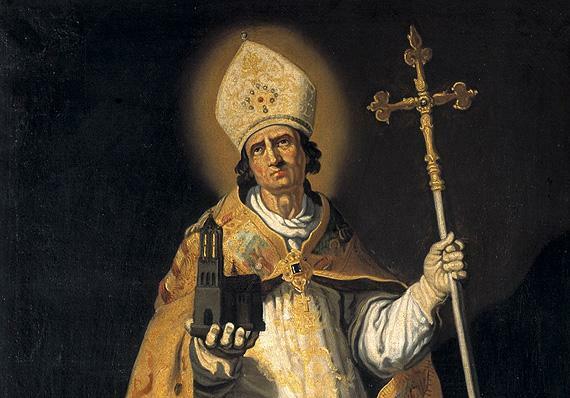 Willibrord, Apostle of Frisia and a missionary archbishop. He was born in Northumbria, studied at Ripon monastery under St Wilfrid and spent twelve years studying in Ireland at the abbey of Rathmelsigi, the centre of European learning in the 7th century. After receiving ordination and extensive training in missions, he set out with a dozen companions for Frisia, or Friesland. He faced dangers from outraged pagans and came close to being murdered. Willibrord died on 7 November aged of 81. Willibrord wells, which skirted his missionary routes, were visited by the people, for the healing of various nervous diseases, especially of children. The moving of his relics was celebrated: "the five bishops in full pontificals assisted; engaged in the dance were 2 Swiss guards, 16 standard-bearers, 3045 singers, 136 priests, 426 musicians, 15,085 dancers, and 2032 players". That's some funeral! A Dancing Procession is held in Echternach every year on Whit Tuesday, and attracts thousands of participants.